Random Critical Analysis – Critical analysis of topics that interest me. Critical analysis of topics that interest me. Why everything you have said about the determinants of health expenditure is wrong in one million charts: a response to Noah Smith. 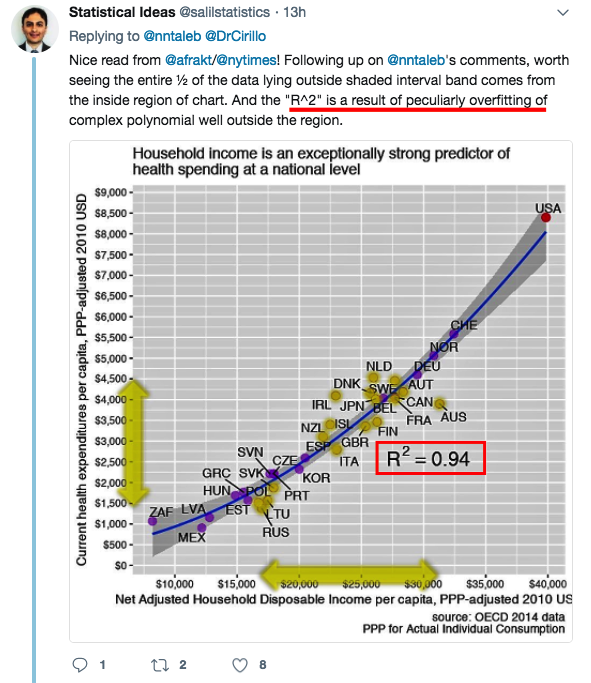 November 19, 2018 December 23, 2018 by rcafdm32 Comments on Why everything you have said about the determinants of health expenditure is wrong in one million charts: a response to Noah Smith. Disclaimer: The title of this post is somewhat tongue-in-cheek and I fell slightly short of one million charts. Also, Noah probably isn’t wrong about everything he’s ever said on this topic, just the central points under contention, and he has tons of company. Noah Smith (Noahpinion) recently published a column in Bloomberg with the title “Health-Care Costs Are Still Eating the U.S. Economy.” This came to my attention because he was kind enough to link to my blog when he alluded to my arguments on health spending. Though there are obvious areas of agreement (e.g., that health spending has risen faster than income; that the so-called “cost curve” hasn’t been bent; that rising health spending puts a very real crimp on take-home paychecks amongst the working class), I strongly disagree with the central arguments he advanced and feel that he did not quite accurately characterize my views. He seems to misunderstand the argument and appears to be insufficiently aware of the evidence against his assertions. Since he is surely not alone in these thoughts, I am going to put some time into weaving together statistical evidence, supporting data, and thoughts I have strewn over a good number of blog posts, tweets, etc. over the years. My goal in this post is to parsimoniously explain the evidence at multiple levels, clear up misperceptions, and address probable objections for the benefit of those that have invested considerably less time into assessing the evidence for themselves. (warning: this is going to be even longer than usual). On the relevance of the income inequality to expected health expenditures. January 20, 2018 November 17, 2018 by rcafdm1 Comment on On the relevance of the income inequality to expected health expenditures. Last week, Hubert Biscuit posted a response on Medium questioning the relevance per capita income to national health expenditures. Note that nothing here argues for or against prices as the predominant factor. He believes that a distributionally-adjusted measure is a more relevant way of understanding health spending and that higher US income inequality implies much lower spending. Several others have also raised similar objections in response to my arguments on US health care over the past year or two. I have several lines of response to these sorts of concerns. Recently on Twitter, Nassim Taleb attacked the r-squared statistic I presented in a single plot in my prior post on health care prices. A detail every appliedprobastatisticists needs to spot. Whenever it’s not a straight line, R^2 cannot be what is claimed because we lose degrees of freedom from fittin *which* nonlinearity. Another guy on Twitter, Salil Mehta, even created an entire YouTube video to argue this point. 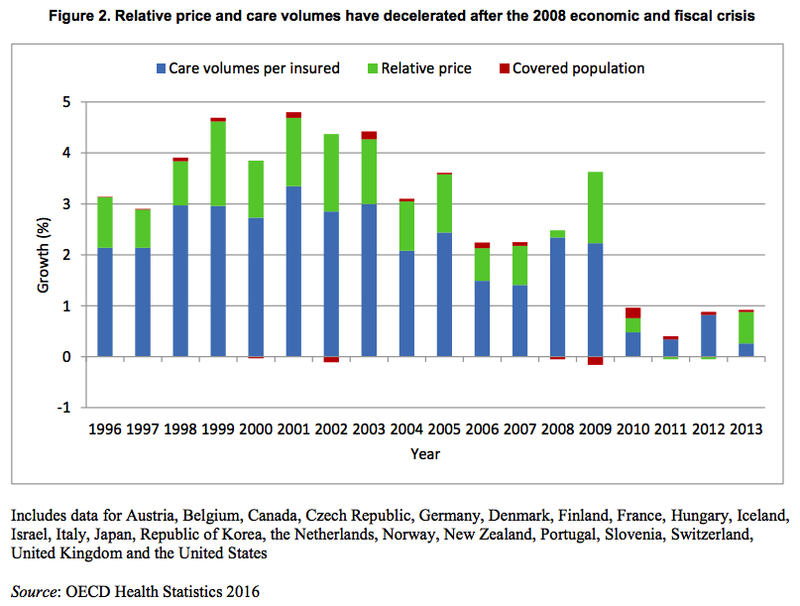 Austin Frakt and Aaron Carroll recently wrote a piece for the New York Times re-hashing Uwe Reinhardt’s fifteen-year-old argument (“It’s The Prices, Stupid”) that high prices explain why US healthcare spends so much more than other countries. Reinhardt’s argument was never well founded, and FC did not substantively advance it. 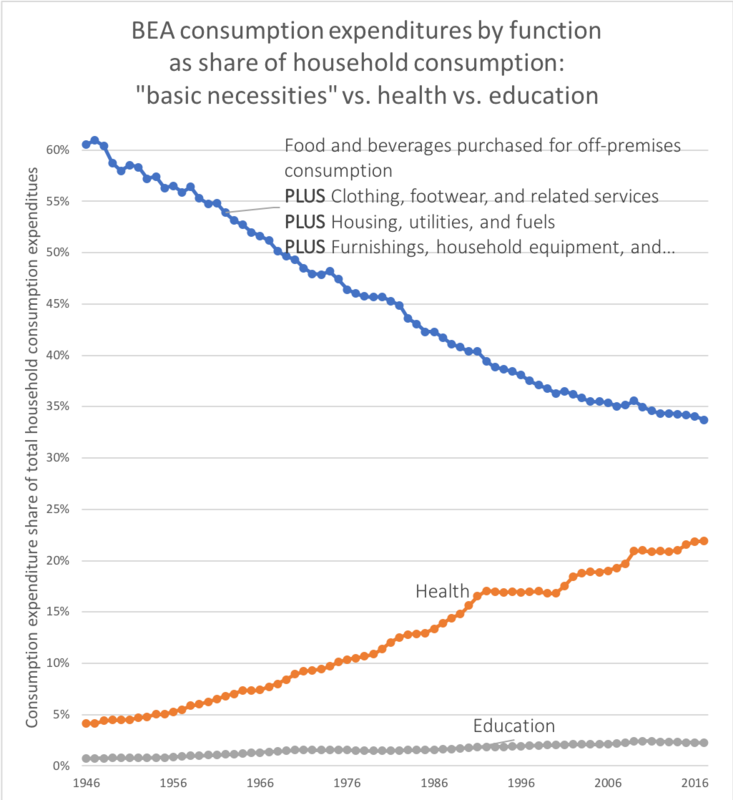 As I mentioned in two (long) posts on how comprehensive measures of household consumption or disposable income explain high US national health expenditures (NHE) rather well, I believe US health expenditures are overwhelming accounted for by higher volume of health consumption (the quantities of goods and services consumed in the health care sector). 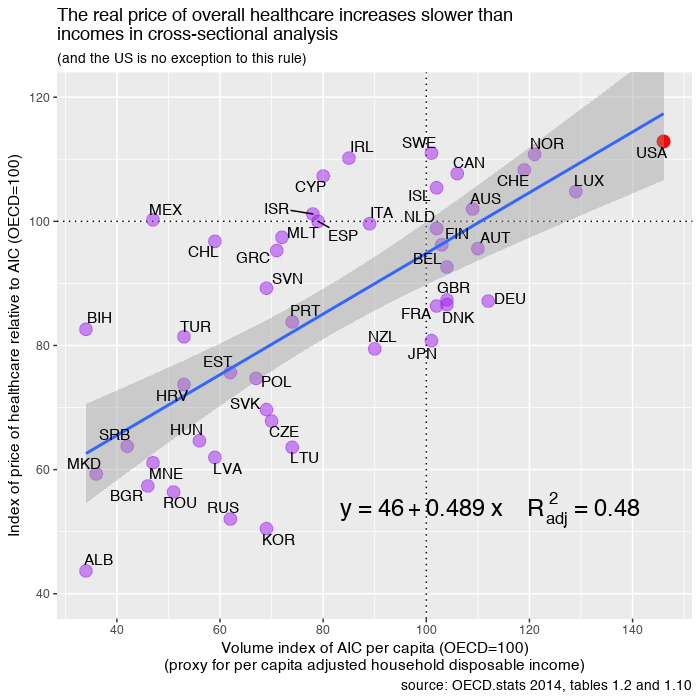 I reject the popular notion that idiosyncratically high prices are what causes the US to spend so much more than other OECD countries and I reject the notion that rising health prices explain why US health expenditures have grown so much faster than income over the past few decades (at least). This does not mean that prices play no role whatsoever in international comparisons of NHE. It does not mean, for instance, that if we could somehow force U.S. physicians, nurses, and various other workers in the health care sector to work for the real remuneration paid to their counterparts in, say, Brazil with equal productivity that the price of medical care, especially more labor intensive categories, would not plummet (presumably real NHE could decrease if volume were hold constant…. not a very safe assumption imo). It means that the reason health expenditures have accounted for an increasing share of our consumption (or income) over time has little to do with prices increasing relative to income and a great deal to do with the volume of health goods & services consumed rising at a faster rate than overall consumption (or income) per capita. Much the same goes for international price comparisons in cross-sectional analysis. The cost of an internationally equivalent basket of health care (both goods and services) rises a little faster than the cost of a broader, economy-wide/GDP, basket of goods and services with rising income levels, but it does not rise all that much faster with respect to income (actually somewhat less overall in the long run). In order to significantly explain the presumably large US residual in NHE per capita (obviously I don’t quite agree with this perspective) there must be a large residual in the actual relative price levels; we simply do not find any evidence of this with the best available evidence. With better data US residual is either slightly above trend (by no means an “outlier”) or below trend, depending on the precise predictor (e.g., GDP, AIC, average wages, etc) and the basket of goods and services employed. In no case do I find evidence of a large departure from trend in any broad, highly impactful, index of health price levels that would suggest that high US NHE isn’t overwhelmingly explained by high volumes of (real) health care consumption. 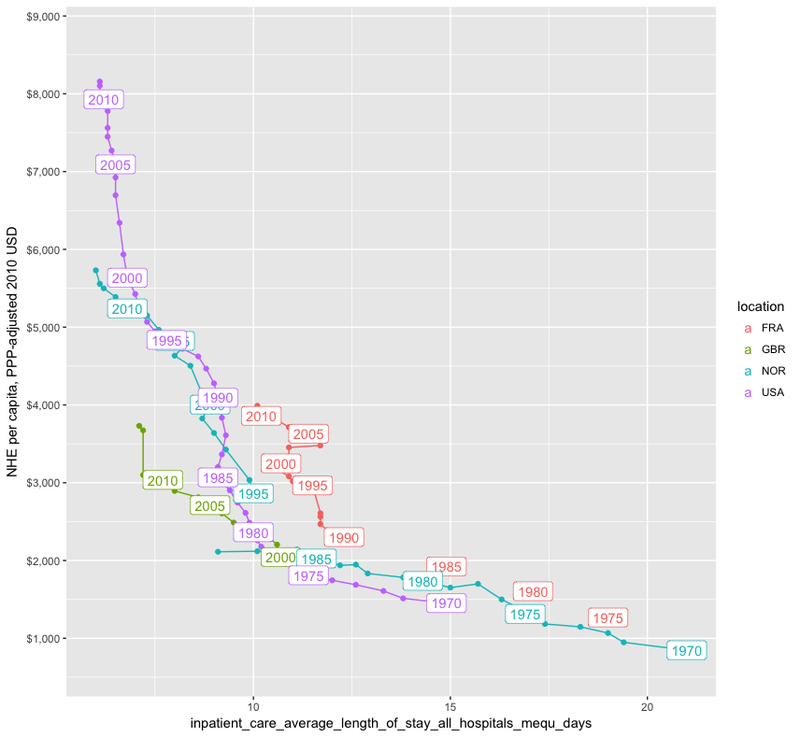 More generally, the cross-sectional and time series data are actually quite consistent with each other, i.e., the issues that drive (US) expenditures up in time series are quite consistent with and related to the what we observe in cross sectional analysis between countries. No, US school funding is actually somewhat progressive. June 22, 2017 November 17, 2018 by rcafdm10 Comments on No, US school funding is actually somewhat progressive. Note: I have already touched on these issues in a much longer, much broader post on education and on twitter at some length, however I thought it’d be useful to zoom in on this issue and marshal the evidence in one place for future reference. It is still commonly supposed by much of the public that school funding is terribly unequal due to reliance on local funding mechanisms (especially property tax). Although there were once modest inequalities associated with local income levels (several decades earlier), this information is generally wildly out of date today. 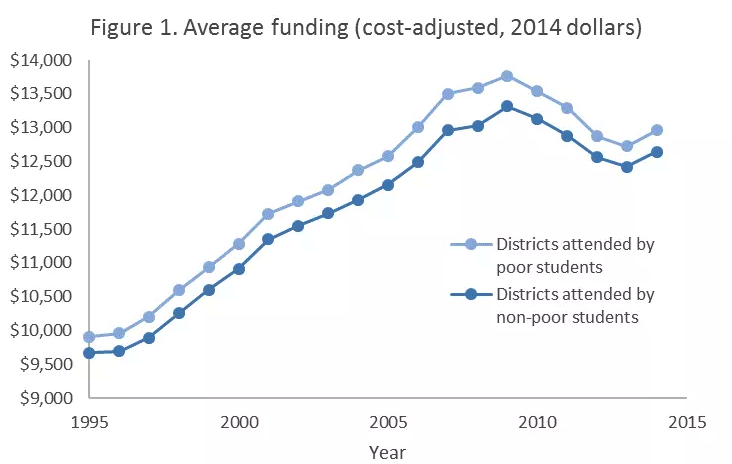 Within the vast majority of states districts with less advantaged students (read: higher poverty, lower income, fewer parents with college degrees, minority, etc) actually spend at least as much money per pupil (often more), both overall and in the narrower instructional expenditure category, and where there are inequalities these differences are usually quite modest and fleeting. Though school funding is still significantly a local affair in most states there is substantial progressive redistribution of state and federal funds that effectively offset these potential inequalities (and then some). Some districts may choose to spend more controlling for income/wealth (tax effort) and there is some variance (mostly poorly explained by any SES measure), so that malcontents can always find isolated examples to complain about, but various formulas employed at the state and federal level sets a floor and effectively acts to prevent there being substantial positive correlations between school spending and district median income (or low poverty rates, percent minority, school free lunch percentage, and so on …. this holds across multiple measures). In 2012, the all-cause, age-adjusted death rate per 100 000 population was 865.1 among US men vs 772.0 among men in the comparison countries (Table 1), and 624.7 among US women and 494.3 among women in the comparison countries. Men in the comparison countries had a life expectancy advantage of 2.2 years over US men (78.6 years vs 76.4 years), as did women (83.4 years vs 81.2 years). The injury causes of death accounted for 48% (1.02 years) of the life expectancy gap among men. Firearm-related injuries accounted for 21% of the gap, drug poisonings 14%, and MVT crashes 13%. Among women, these causes accounted for 19% (0.42 years) of the gap, with 4% from firearm-related injuries, 9% from drug poisonings, and 6% from MVT crashes. The 3 injury causes accounted for 6% of deaths among US men and 3% among US women. The US death rates from injuries exceeded those in each comparison country (Table 2). Among men, these injuries accounted for more than 50% of the life expectancy gap with Austria, Denmark, Finland, Germany, and Portugal. Among women, they accounted for more than 30% of the gap with Denmark, the Netherlands, and the United Kingdom. The country-specific comparisons depend partly on the actual size of the gap in life expectancy between the United States and each country. 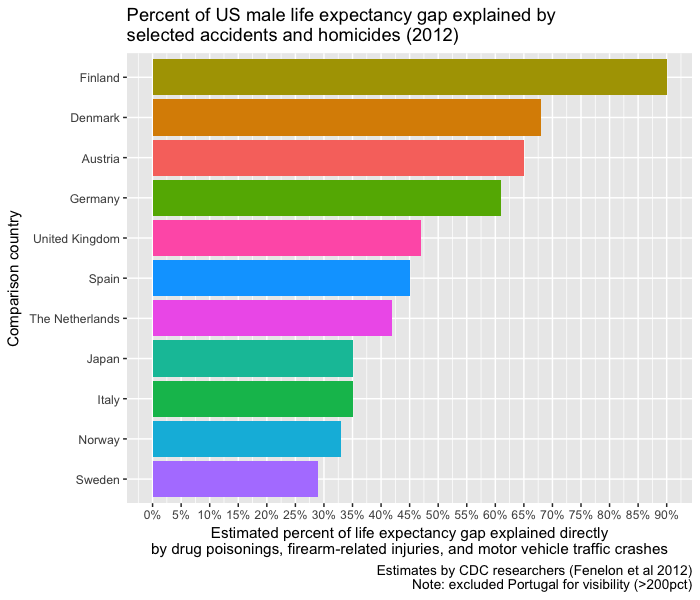 For example, men in Portugal have lower injury mortality than US men, but a small life expectancy advantage, which results in the 3 injury causes accounting for more than 100% of the gap. They didn’t provide any visualizations so I thought I’d share some using their estimates. Previously I demonstrated that actual individual consumption (AIC) is a superior predictor of national health expenditures (NHE) and largely explains high health spending in the United States. 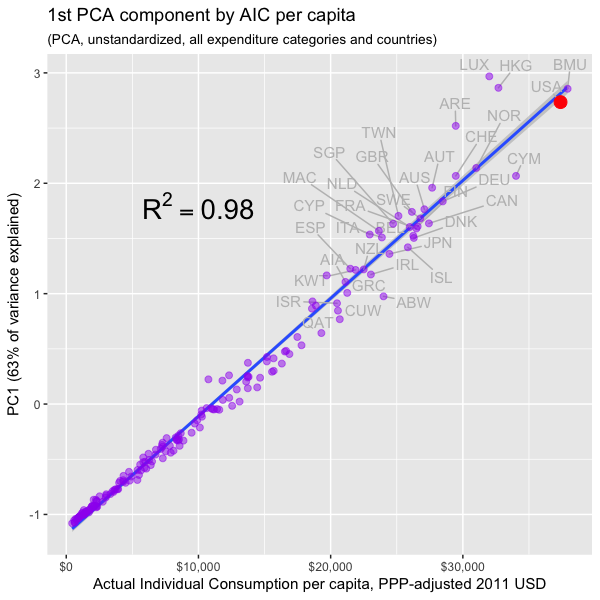 Towards this point it is instructive to show that not only are health expenditures generally coordinated with AIC, but that all other major categories of expenditure are too, i.e., at given level of real consumption per capita all countries will tend to allocate their consumption quite similarly. In this post I make extensive use of Principal Components Analysis (PCA) and related dimension reduction techniques to better characterize consumption patterns across several major categories of consumption in both the spatial and temporal dimensions. I find that there is a latent factor that explains the great majority of the variance in consumption, that it is exceptionally well correlated with AIC, and that GDP has essentially zero incremental validity once we have accounted for AIC for practical purposes. I also show that this factor holds up well to price adjustment for each consumption category and correlates similarly with AIC within the OECD. Although my interest here is (was) largely in verifying my prior analysis as it pertains to health expenditures, i.e., that AIC is real, meaningful, and the measure we probably ought to prefer when discussing the efficacy of cost containment regimes, my analysis has broader implications. For instance, it provides evidence (albeit in a roundabout fashion) that argues rather strongly against Scott Alexander’s widely cited post on cost disease, i.e., if health, education, construction, and so were truly uniquely expensive in the United States, the United States ought to stick out like a sore thumb in PCA and the like. Instead what we found is that the US consumption patterns track well with its high overall level of real consumption (AIC). Moreover, anticipating the argument that perhaps cost disease is simply well correlated with AIC, when we adjust for category specific price levels (i.e., “volumes”) we find PPP-adjusted AIC holds up very well in explaining the variance in the actual volumes consumed overall and that the US is, again, well on trend (which suggests actual apples-to-apples differences in cost are not the problem and actual increase in the quantity and quality of goods & services consumed in these categories drive most of the variance). Previously I have shown that household gross adjusted disposable income and actual individual consumption (AIC) are superior predictors of national health expenditures (NHE) and that they largely explain why US national health expenditures (NHE) are so high. However, my analyses have been restricted to the handful of mostly highly developed countries affiliated with the OECD for time series and the World Bank’s International Comparison Program (ICP) for cross section for ~all countries in 2011. 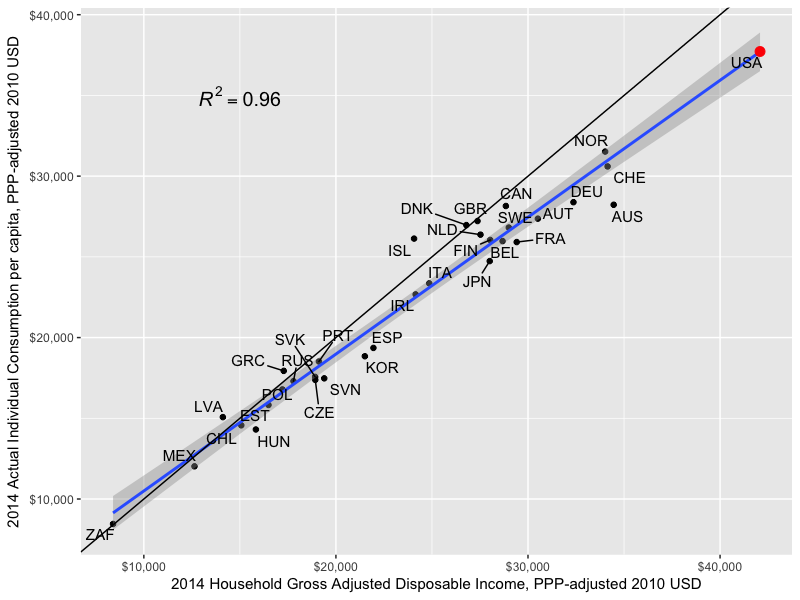 I know of no simple ways to retrieve AIC or adjusted household disposable income outside of OECD in readily comparable formats, so I decided to spend a little time constructing these estimates for a much broader array of countries using the official system of national accounts tables available from the UN statistics division, which mostly covers between 1990 and 2014. This Commonwealth Fund report has been widely cited for explaining why US health expenditures are so high. accessible technology and greater obesity. Since I have already spoken to the incomes argument at some length and explained why I find overall “high prices” to be unpersuasive as it pertains to NHE in general and the US specifically, I will instead focus narrowly on this utilization argument since there are a number of similar analyses with identical/similar indicators. The report proffers this table as an explanation for why high utilization cannot explain high US health expenditures. My problem with these sorts of analyses is that these sorts of indicators do not themselves account for enough NHE directly or correlate with NHE well enough to claim to account meaningfully for utilization and other major non-price drivers of NHE (if you wish to remove quantities of technology, prescription medicines, etc from “utilization” for semantic reasons). When (1) your utilization measures can only account for maybe 10-15% of the variance (2) only relates to a modest proportion of NHE in most developed countries and (3) one ought to know there are other major cost drivers to account for, it’s pretty silly to claim that your half-hearted attempt to explain the variance honestly means it cannot be utilization and that it must be (mostly) the result of some US specific prices. Proudly powered by WordPress Theme: Matin Pro.